The winning submission is titled Chroma Key Protest. 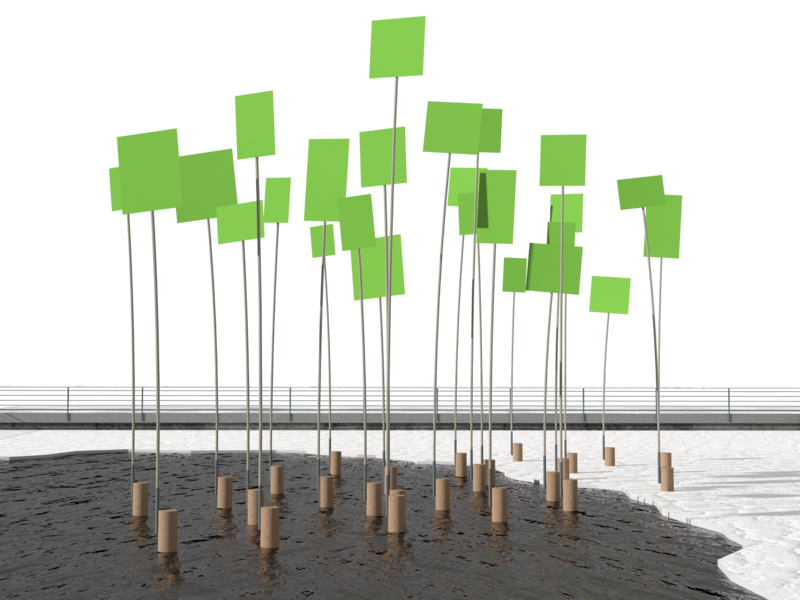 Twenty-five wooden buoys are anchored in the basin, each with an arm extending upward and holding a placard of bright chroma key green. Individually, the buoys could be mistaken for a new kind of marine marker, but as a group they resemble an organized group of protestors occupying a public space. Chroma key green is commonly understood as a physical placeholder for a digital image or message. In this installation, the use of chroma key green in the context of a protest removes a specific message and invites the onlooker to derive their own meaning. Some may see the gathering as a show of solidarity: individuals bound by a common goal. Others may see the gathering as futile: individuals hopelessly attempting to manifest change. In either case the message transmitted by the placards is secondary to the presence of the protestors who – day after day – take to the streets. © 2018 Solve Architects Inc.